First, today, there was the madness and the dissonance, sharp as thorns. 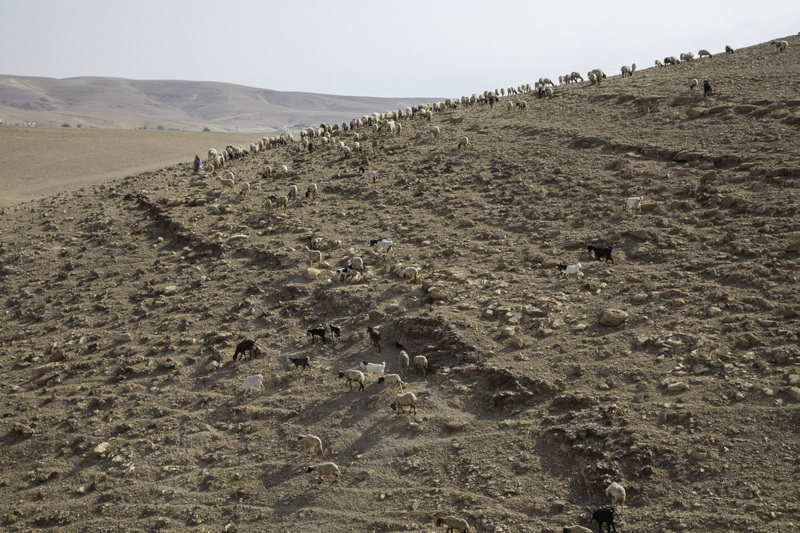 Early morning in the Jordan Valley: still cool. We step out into the light. In the distance, the soft, convex mauve of the hills. Closer to us, they turn beige, then white, billowing like waves. Closer still, it’s all yellow and brown and thick with jagged pebbles. About two hundred yards away, scattered over the slope, are black and white goats and disheveled sheep. I recognize one of them, from long-standing acquaintance; her fleece has been dyed a spotty red. 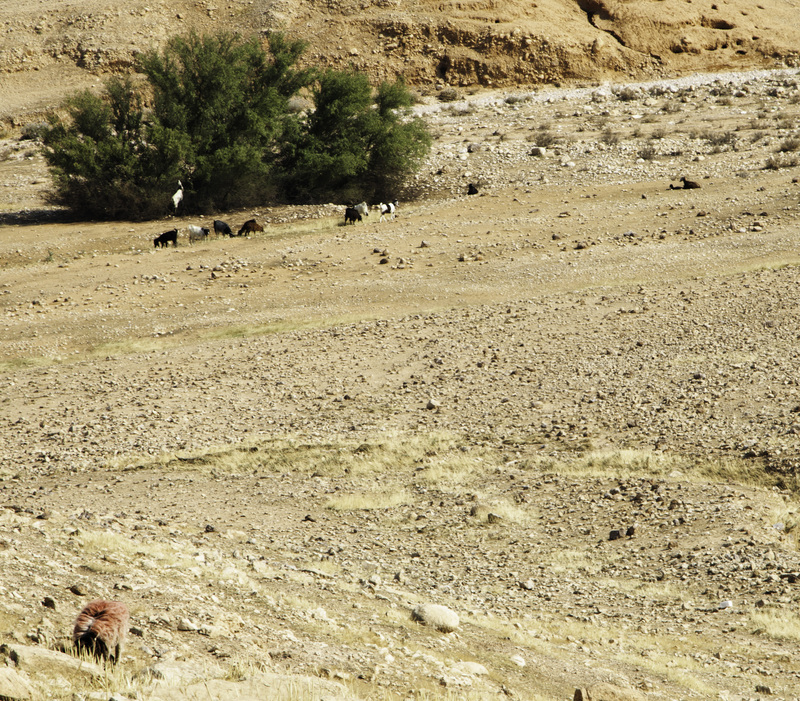 There’s a donkey, too, down in the wadi. 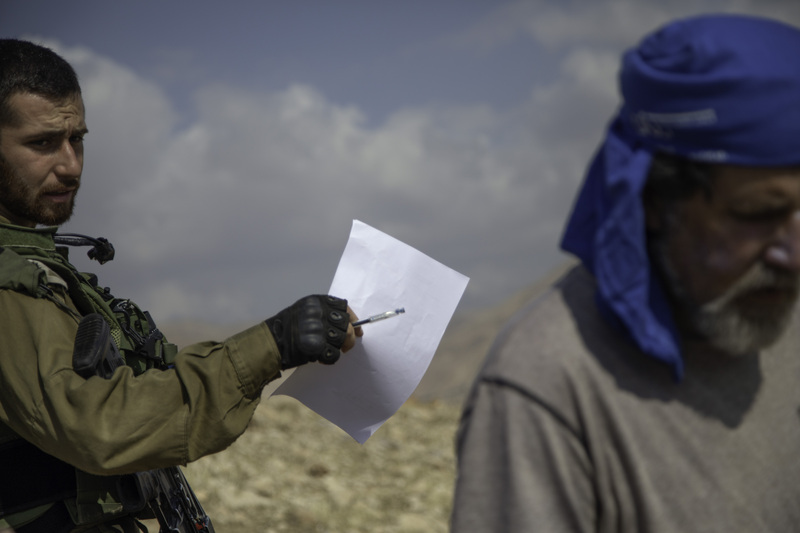 Two young shepherds—Ahmad, whom I know well, and Mhammad. 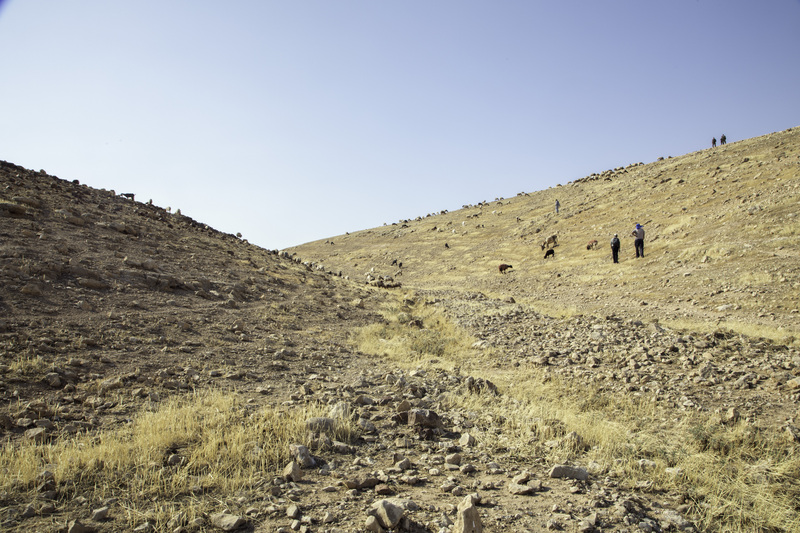 This hill and the wadi are also, by now, old friends. Hence the madness: Is it possible that human wickedness can survive in this vast beauty? Wouldn’t it dry up in the fierce light or melt in the mid-day heat? But clearly it doesn’t. Who, in this elation of color and shape and touch, could think the thought that is evil? Who would harbor a desire to banish those shepherds and their flocks? They belong on this hill. They live here. They harm no one. They have always been there. Only a supreme delight in inflicting pain could drive the system that drives us off today. 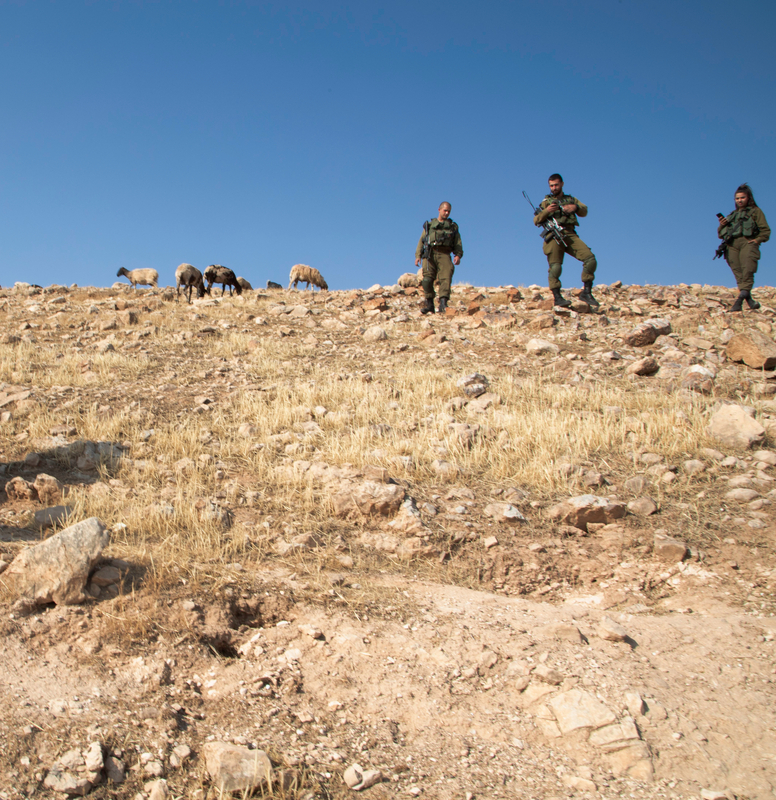 We see the soldiers from a distance, before we can rendezvous with the shepherds. Three dark silhouettes on the hilltop, the guns darker still. This, too, is a surprise, a black intrusion into the silence of the desert. Ahmad and Mhammad have been out here for an hour or more—they go out early, since by mid-morning it’s too hot even for the goats and sheep. They greet us warmly, shake our hands, and by now the soldiers are there, too. T., the officer, wishes us a good morning. He is affable and rather gentle. A smile, almost shy. He takes our identity cards away. The other two, male and female, have nothing to say. The young woman, also laden with a gun, is chewing gum and seems bored or, as Peg says, striving hard to achieve an out-of-body experience. Amazing how quickly the heat sinks in. 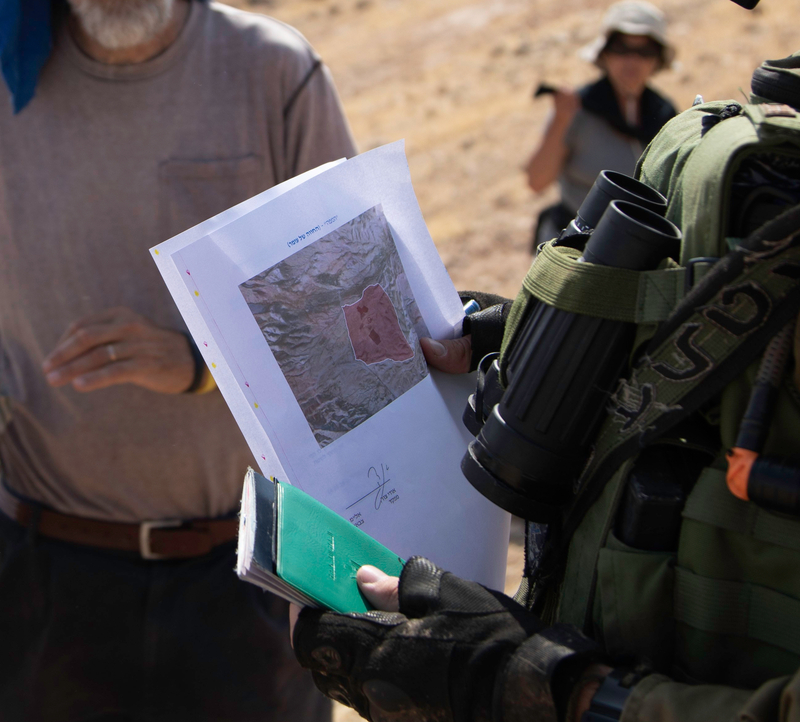 “Just out of curiosity,” Arik says, mildly, a teacher, “do you happen to know the status of that settlement over there?” We can see it from where we stand. A dense crowd of green date palms in the middle of the yellow desert. Inside the grove lives Omer. He took over the land, a huge area, when the army cleared out of a base it had had here, ten or twelve years back. Until a year ago, Omer ruled like a sheriff. 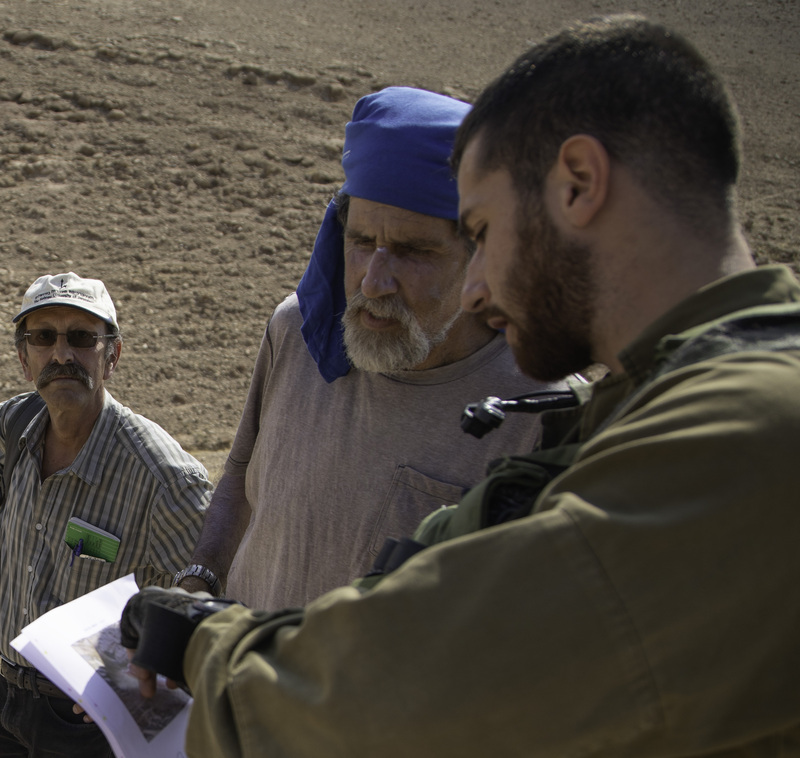 He sustained a temporary setback when the army made its agreement with the Palestinians. For the last three months or so, he’s been making a comeback. They say he’s well connected with the high command; perhaps with right-wing politicians, too. Who knows? 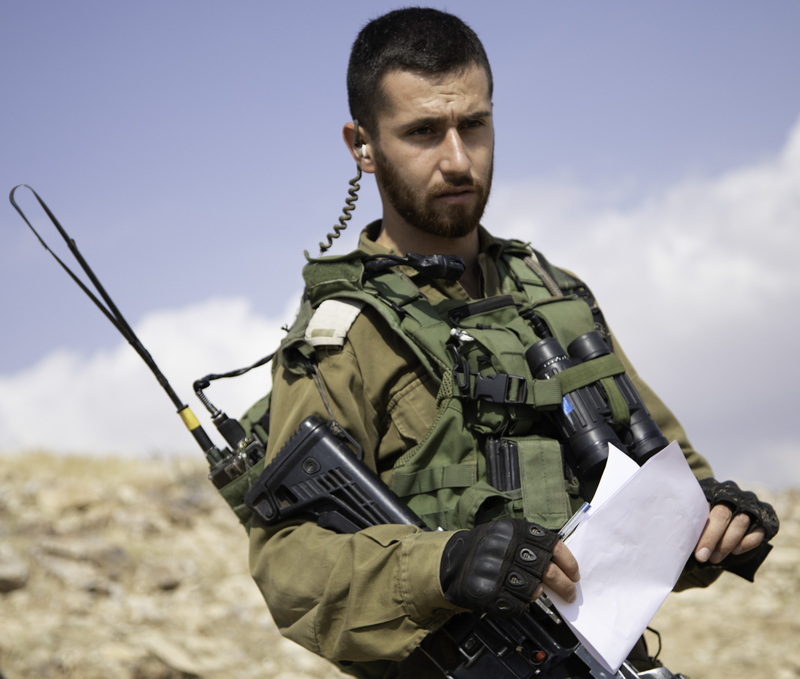 What is certain is that the soldiers now take their orders from Omer, which is why they are here with us on this hill today. Omer doesn’t like Palestinians anywhere near his date palms. That’s the hardest thing. Thinking. Especially for soldiers. The settlers are a lost case, there’s no point, but sometimes soldiers can be invited to think. T. says, “I’m new down here, just a month and a half. I heard about the agreement, but I’m not much interested in that. I’m a field soldier. I deal with reality. My job is to carry out my orders.” A lucky man, he knows what reality is. Meanwhile, the goats are chewing on what lean pickings they can find. It’s summer now; the real food is gone until next winter. Anyway, they’re busy in that meditative, genial way goats have. Peg says to me: “Isn’t it interesting to watch them eat? They don’t seem to fight, ever, for some juicy mouthful. Unlike humans.” My heart sick with dissonance, for a moment I admire the apparent altruism of goats. A surprise: the second soldier, hitherto silent, says, “Yeah, maybe I’ll think about it when I get home.” Or something like that. I’m not sure I heard him right. Not all is lost. “It’s something between you and yourself,” says Arik, “or between you and your god.” Arik is one of the few people I know, maybe only two or three, who use that word in an easy, natural tone, like talking of trees or goats; a tone that carries a whiff of truth. T. comes back down the hill waving the order. There’s a map with a big pink patch in the middle. “We are here,” he says confidently, pointing at the middle of the patch. “You have to be there”—outside the patch. 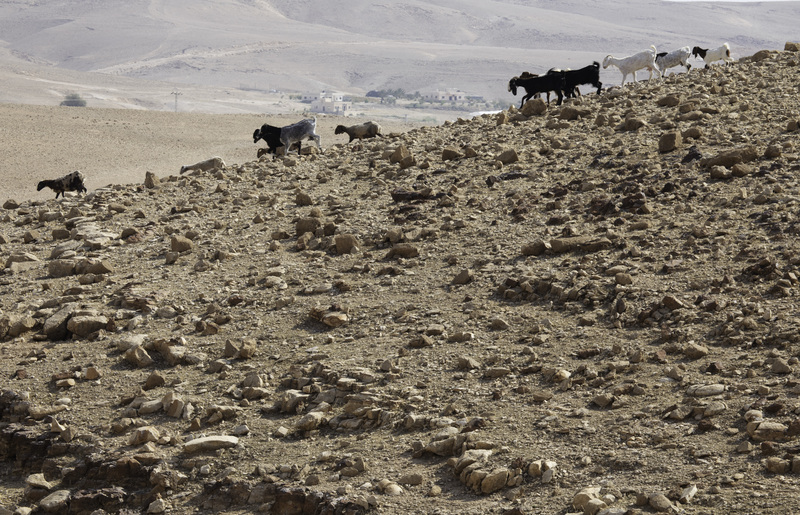 By now the goats have put some distance between themselves and the soldiers; they’re moving toward home. Mhammad wants the officer to know that one of the settler thugs stoned his sheep this morning, and he has a video on his phone to prove it. T. watches it and says he will act. I can’t make head or tail of the map, but I can see that it’s the last nail in the coffin of the agreement we had with the army. Exile again. Whatever we gained has been taken away. 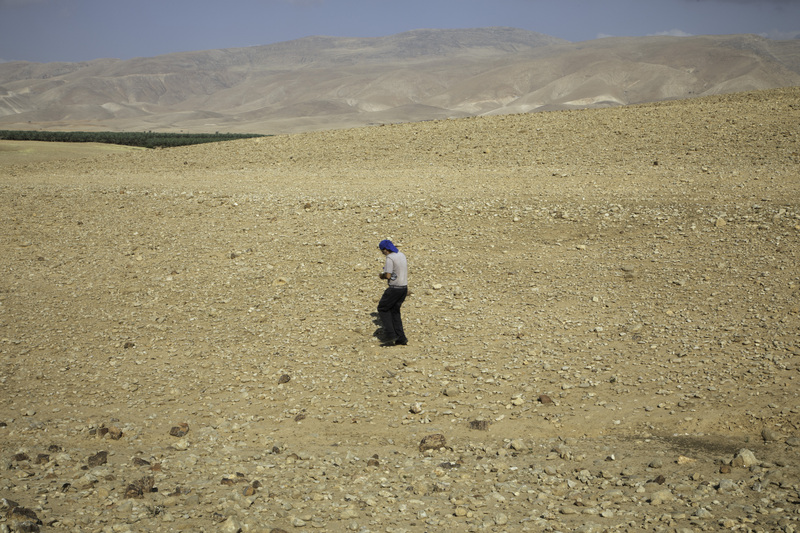 This hill, these rocks, the wadi—all gone. We have to start over, and that is what we will do. T. wishes us a happy day. Turmus‘ayya, in the central West Bank, has the misfortune to have the large, veteran settlement of Shiloh as its neighbor. There are other settlements, too—Eli, Adei Ad. Shiloh is where the Art of the Covenant rested for long years before eventually being brought to Jerusalem. Where the prophet Samuel grew up. Once it was a holy place. 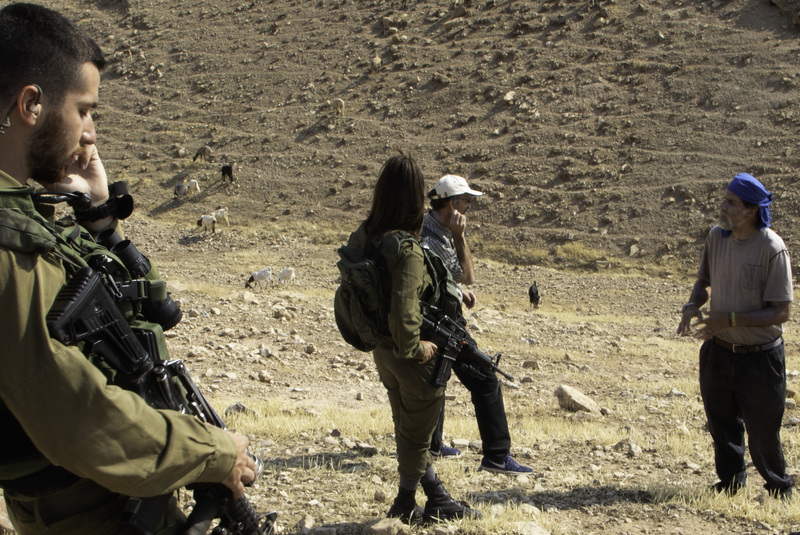 Now the fertile valley between Turmus‘ayya and the settlers is a battlefield. Settler violence is a daily business. There’s no doubt they want to take over the whole valley with its fields and olive groves. Two weeks ago settlers came into Turmus‘ayya at 2 AM and set fire to several cars. How many? We ask Abu Sama‘. Four. Well, actually, seven. Actually, ten. 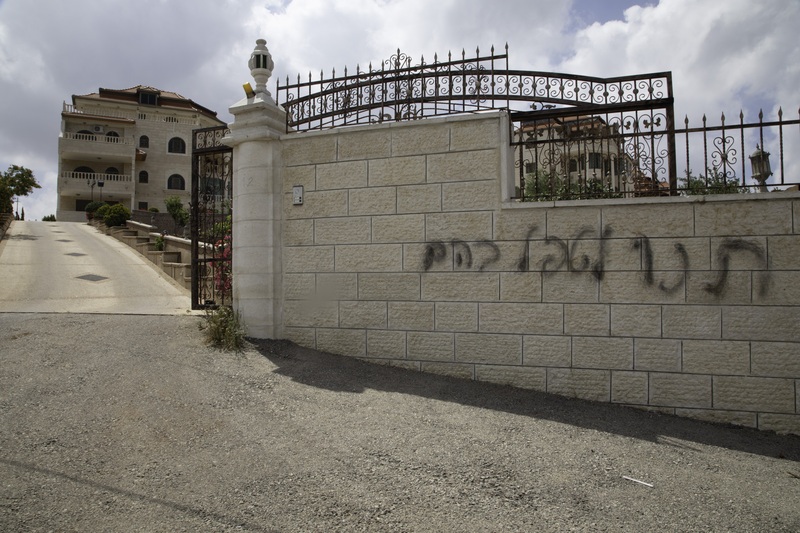 There are Hebrew graffiti on the walls of homes: “Let us handle them.” “Them” means Palestinians, and “handling them” means just what you think it means. Yesterday the Palestinians of Turmus‘ayya planted olive trees in their fields, and beside every tree they planted a small plastic flag. Not just Palestinian flags—some are Turkish, Iraqi, Swiss. It’s not so easy to see the olive saplings, but the valley is dancing with flags. Arik was there during the planting. 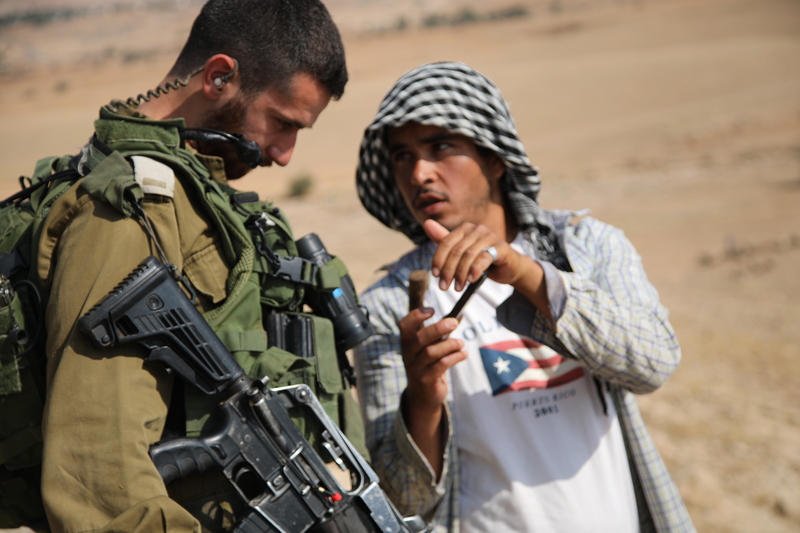 Settlers came down to uproot the baby trees, then the soldiers arrived, and the Border Police. “What’s that thing on your head?” the Border Police asked him. “You know what it is.” “Are you even Jewish? Were you circumcised?” “Do you want me to show you?” As Arik says, it’s bad enough when they see a Jew standing up for Palestinians, but a religious Jew—that drives them crazy. The discussion ended with volleys of tear gas. 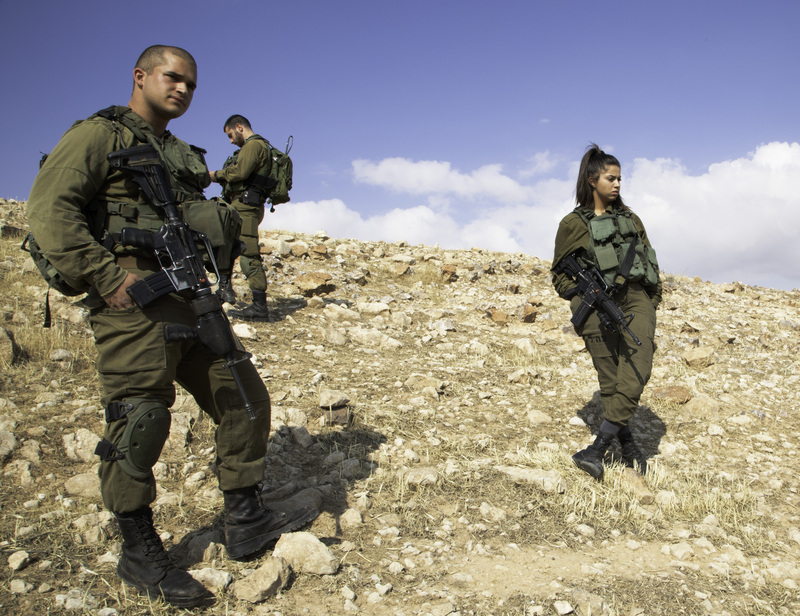 So the practical problem for now is to get the army to recognize the Supreme Court ruling that unequivocally allows Palestinian farmers access to their fields—and to get the soldiers to protect them from marauding settlers. I think this is an achievable goal. Note, however, that the government is pushing new legislation that will allow a simple majority vote in the Knesset (61 MP’s) to override the Supreme Court. If it passes, the very idea of inalienable human rights will be erased, and we will be living under a tyranny of the majority—nationalist, annexationist, racist, whatever you want to call it. That’s the idea. What will happen to those fields? Those trees? What will happen to people here in Turmus‘ayya, to people like us? But Turmus‘ayya, scarred and battered, has a reassuring, solid look. Today there are over 50 dead on the Gaza border and over a thousand wounded, many of them children. By tomorrow the numbers will rise. The same malevolent system that seeks to expel the shepherds of Al-Auja and the northern Jordan Valley, that craves to demolish the homes of our friends in Susya, that routinely terrorizes the people of Turmus‘ayya, has brought us to this point of despair. Some of those soldiers who shot today will someday agonize in remorse, though they don’t yet know it. Two and a half million people live in the open-air prison that is called Gaza; when they protest, they are killed. Some, inevitably, are violent. Violent, too, is the system of the occupation, put in place with the sole goal of stealing ever more land. From Gaza to Al-Auja, hour by hour it works its savagery, which all too few Israelis allow themselves to see, though many, perhaps most, know it without knowing that they know. Each time I go there, I come home grieving; I wander through the house and the streets, restless, looking for myself, as if I had misplaced that self and forgotten where. Today, too, it is like that, for the grief is more than I can bear.